STRATFORD—The old barn known as the Needham Memorial Gymnasium was sold out on Wednesday night as the Stratford boys basketball team hosted cross-town rival Bunnell. Those left on the outside, unable to even look in, missed one helluva game. The latest chapter in the boys basketball rivalry between the host Red Devils and the visiting Bulldogs went to the home team, which pulled out an exciting 58-55 win in front of an estimated 650 fans. Jack Ryan led a balanced scoring attack with 14 points while freshman Jayquan Kirkland added 13 for the Red Devils, who improved to 12-5 on the season, 9-1 in SWC play. Zack Fedak added 9 points, Preston Williams had 8 while the August brothers—Mike and Joe—had seven points each. Elijah Alexandre led Bunnell (11-5 7-2 SWC) with a game-high 15 points while Khalid Moreland added 11. In the first meeting between the two rivals, a non-league game back on Jan. 4, Bunnell led by as much as 18 en route to a 70-64 win. Wednesday’s rematch was nip-and-tuck all night as the game featured seven lead changes and seven ties. Stratford’s largest lead was seven (50-43 in the fourth) while Bunnell had two four-point advantages in the first half. Leading by one, 52-51, in the final two minutes, Stratford went 4-for-4 from the foul line as Joe August and Fedak both made two foul shots. A lay-up by Mike August, off a back-door feed from Ryan, with 15 seconds left pushed the Stratford lead to 58-55. 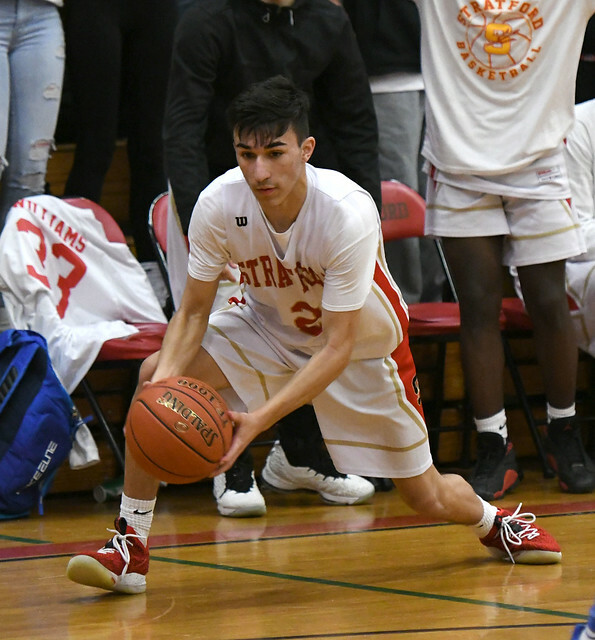 Following a pair of time-outs by Bunnell with 5.2 seconds left, the Bulldogs missed a game-tying 3-pointer from the right baseline, giving the host Red Devils the win. The Red Devils made sure they weren’t too amped up for the game and remained focus on the task at hand. The Red Devils took turn making big shots—including huge 3-pointers by Fedak, Williams and Kirkland when Stratford needed them the most. On the other end of the court, meanwhile, Edwards seemed to be off the whole game, scoring just six points. Powell even sat his star player for much of the third quarter, trying to snap his team out of the funk it was in. Stratford, meanwhile, kept the pace of play right where the Red Devils wanted it for much of the game. As for Edwards, Swaller recognized it was just a star player having an off night more than what his team did to shut down the junior standout. It was the second straight year the two teams split, winning on their own home courts. 3-pointers: B—Alexandre, Leak; S—Fedak 2, Williams 2, Kirkland, Ryan; Team Records: Bunnell 11-5, Stratford 12-5. Photo album from Wednesday’s game.